Join the EURO Handball Young Reporters Team 2015! 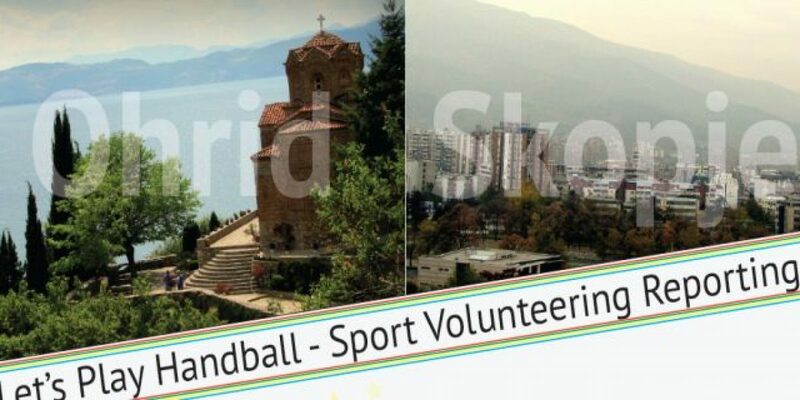 Mladiinfo International will host 30 young journalist students from 15 European countries to participate in the “Let’s Play Handball – Sport Reporting Volunteering” EVS Large Scale project! In 2015, Macedonia hosts the 17th European Women’s Youth Handball Championship. Within this project, we want to tackle the challenges of lack of interest among young people in sports and lack of professional training for young people during their studies. Therefor, the “Let’s Play Handball – Sport Reporting Volunteering” EVS Large Scale is an opportunity for 30 journalist students to spend 40 days in Macedonia (22 July – 31 August, 2015) and to go more deeply into journalism and multimedia, to produce articles and other multimedia contents that will document the course of the Women’s Youth Handball Championship. Web-content workshop (5 days: participant produce various media contents and learn webpage postings, editorial of photos, videos etc / launch of a special webpage that the volunteers will use for reporting while the Championship is ongoing). 12 Journalists: The ideal candidates should be graduates or students in the last year of journalism, or freelance media makers/journalists who actively contribute to some new or traditional media and have at least 6-month work experience. Applicants are expected to be familiar with the basis of some video-editing programme as well as to have general idea of camera recording. 3 Cameramen/3 Photo journalists: The ideal candidate should possess and know how to work with a suitable photo/ camera and other recording equipment. Applicants should have a year of experience in photography/recording shots as a professional cameraman or as a freelancer. Knowledge of computer software and hardware, electronics and media production is more than welcomed. 4 Web-page Editors: We look for young media makers familiar with Content Management Systems (CMS), Drupal, WordPress, Joomla and/or some other publishing platforms. They should also have at least one-year experience working as young journalists/media makers and preferably, they should have educational background in journalism. Experience in media management and editing will be considered as a plus. 4 Social Media Gurus: In-depth knowledge of social media channels is required (Facebook, Twitter and Instagram) as well as experience with management of a Facebook fan page, active Twitter profile or similar activities. Notice: Candidates doesn’t need to have a sending organization. But please note that candidates should not have been EVS volunteers previously. This needs be their first EVS Service. After this short-term EVS project, the selected EVS volunteer can apply for another EVS long-term project up to 10 months in another country! All costs for participation (accommodation, pocket money, travel to/from Macedonia) in the project will be covered for the selected volunteers. Regarding the travel costs, please check the travel rate per country listed in the official call. Send your email with contacts to [email protected] and our team will be right back to you. For more information please go through THE OFFICIAL CALL available HERE. Such are the ingredients of Adiphene that its one finest selling level is the shortage of dangerous uncomfortable side effects. consult a physician before taking this diet pill. Sonnie Mc – Lemore is a health and fitness blog owner. Not just for cooking, olive oil has its place in skin care. A dermatologist can determine if you need an acne pill or not. Homeowners should learn enough about plumbing to know when they don’t know enough. Not many plumbers offer an estimate of the repair cost over the phone. You can relax because his technicians will answer your questions and provide you with a written free estimate before any work begins. take valuable information concerning my study and knowledge.